In the UK, the tradition of indoor climbing is strong. 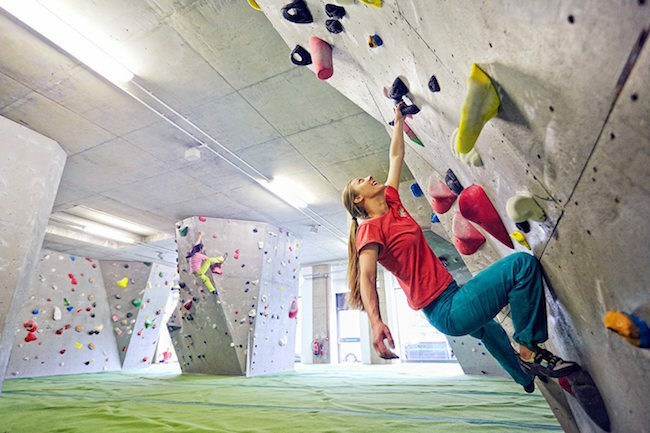 It’s said that the world’s first climbing wall was built in 1964 at the University of Leeds and with over five decades of the industry’s history, it’s not a surprise that some venues are considered iconic. 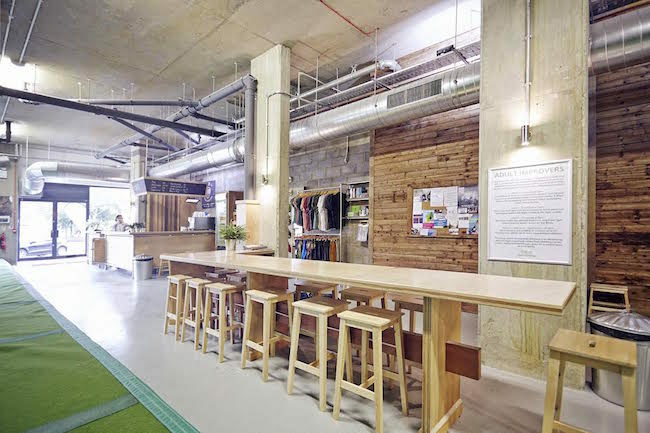 High up on the list are The Climbing Works in Sheffield, known for its proximity to the country’s best bouldering and a crowd of pro and semi-pro climbers, and Mile End Climbing Wall in London, considered to be the first dedicated facility in Britain. Recently, a new contender is moving quickly up the ranks, becoming a dominating force within the industry. The history of the Arch Climbing Wall spans less than a decade, but thanks to the vision of its director, the brand is developing faster than any other in the UK. Chilled and well spoken, Fred Stone is immediately recognizable as a climber. Even though he’s a businessman, a husband, and a father of two, it’s much easier to imagine him dirtbagging than closing business deals. After graduating with a degree in French and Italian literature, he moved out to Egypt, but love brought him back to the UK. He settled in London with his wife to be, and one of his first jobs in the capital was route setting at Mile End Climbing Wall. With an investment of some GBP100,000, and an immense amount of luck, Stone converted one of the Victorian arches underneath the tracks emerging from London Bridge station into the capital’s most central climbing wall. Finding the venue was like hitting the jackpot, yet the first couple of years were tough, “trying to pay the bills and keep sane,” he said. And even when the business finally picked up and Stone had paid off all his debts, the idyll was short-lived. “We were forced to move out in 2011. Network Rail reclaimed all the arches for redevelopment. I really thought the wall was going to be where it was, to stay there. I didn’t see it outgrowing the space, or developing. At that point, any thought of expansion was still a nightmare, but as it turned out getting kicked out was kind of a blessing. It made a crossing in our road,” Stone said. Stone was faced with a tough choice of walking away with money or reinvesting everything. He chose the latter and, after a brief hiatus, The Arch reopened in a new, sweet location: a disused Peek Freans biscuit factory. With over 10,000 sq ft of open space, the new Arch became what many considered to be London’s best and biggest bouldering-only climbing wall. And within only two years Stone announced the opening of a sister site, Building One in 2014. Less than a 15-minute walk from The Biscuit Factory, Building One is slightly bigger, and features a 60-ft high glass covered roof. The video ad announcing the opening of Building One was viewed over 75,000 times. Every evening, both The Biscuit Factory and Building One are packed. 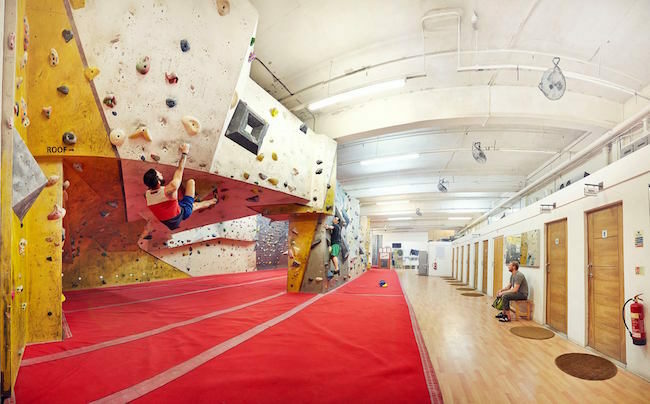 And now, under the same membership, climbers are offered a third venue: Arch North in London’s northern district of Burnt Oak. With three busy climbing gyms in the capital, you’d expect Fred Stone to be anxiously zipping back and forth between the venues. Nothing could be further from truth. Stone lives in Devon with his wife Roz and twin toddlers. Their house is by the sea, some 200 miles away from central London. It’s a good place to raise a family, and it allows Stone to pursue another passion – surfing. “I compress all my meetings into a couple of days every fortnight. I don’t necessarily tell my business contacts that I don’t live in London; I just say, could we do it this day, or this time,” Stone said. Leaving the business unattended would make your average director at least anxious, but as mentioned, Fred Stone is a chilled man. “I trust the people I work with. If I’m not around, they do their own thing and only come back to me if they’re really unsure about something,” Stone said. “Everybody who works under me, they can’t develop if they’re micro managed, or if I’m trying to do their jobs. It’s also not what the business needs to develop,” he went on to say. Once a month all full-time employees have the option to take a paid day off and volunteer for a charity of their choice. “Having them feel like they’re fulfilled and happy is probably key to getting long life out of your staff,” he said. One of the unique options available to Stone’s employees are routesetting courses which can be undertaken for free by all staff members. The hours are paid and the structured syllabus includes exams, practical tests, and a number of shadowing sessions. At present, The Arch has an in-house team of four full-time routesetters headed by a manager. They are aided by a pool of part-time setters hailing from employees, as well as guest ‘star’ setters. However, Stone believes that investing in the in-house team is key. To avoid having both setters and climbers getting hung up on grades, the problems are set in color-coded circuits spanning approximately two grades. Each of the three centres offers ten circuits of varying difficulty (from under V0 to over V8) at any given time, and to keep things fresh, setting is carried out four to five days a week. Quality setting is one of the key elements putting The Arch at the centre of the climbing community. Smart sponsorships are another way to strengthen the brand, and at the moment The Arch supports Fran Brown (World Champion para climber) and Matt Cousins (British Bouldering Champion). Stone believes it is possible to cater for everyone in a way that’s not yet been done, and without creating a distinction between core climbers and other members of the public. “Part of it is the way the industry thinks of climbing, and maybe the slightly condescending feeling we have towards the non-climbers. But offering what the non-core climbers want is not about watering climbing down. It’s about distilling it and making it more accessible,” he said. Every business decision is made on the basis of three key values: health, sociability and enjoyment. The three emerged in 2011 and now underpin The Arch’s unique identity as a brand and inform its development. Since moving out from London Bridge, none of The Arch’s venues were intended solely for climbers. There are parkour, calisthenics, yoga and circus skills classes taught at the gyms which also feature well-equipped bodyweight training areas. “A lot of people within in the climbing industry forget that climbing is not the end goal of what we do. What I’m interested in is what happens when we stop chasing after climbing as the end goal, and just have it as a medium through which we work,” he said. The values-based approach had an interesting effect on The Arch’s Monthly Roundup competition known as TAMRU. After starting out as a traditional comp involving rankings and prizes, it became an inclusive charity event that welcomes both beginners and pros. Competitors are still given score cards, but rather than points, each problem they climb equals a 50p donation made by The Arch to charity. “We choose a different organization each month. The suggestions come both from customers and the staff. It’s a really nice thing, and it’s changed the atmosphere of the comps. We get people who may only climb two problems, and not because they’re lazy, but because it’s all they can climb out of the comp set. But it’s still a valid entry that still really equals something at the end of it,” he said. As climbing becomes more and more popular and artificial walls spring up like mushrooms, Stone is not worried about competition. He believes that by opening their doors to outsiders, climbing walls can simply expand the market. “Everybody in the industry is too insecure to admit that. We’ve got our climbers, we’re doing our thing. Nobody could possibly move in… Well, fitness gyms still somehow manage to function so close to one another,” he said. Yet to make sure they stay ahead of the quickly expanding pack, The Arch invests more time and effort into marketing than any other wall in the UK. 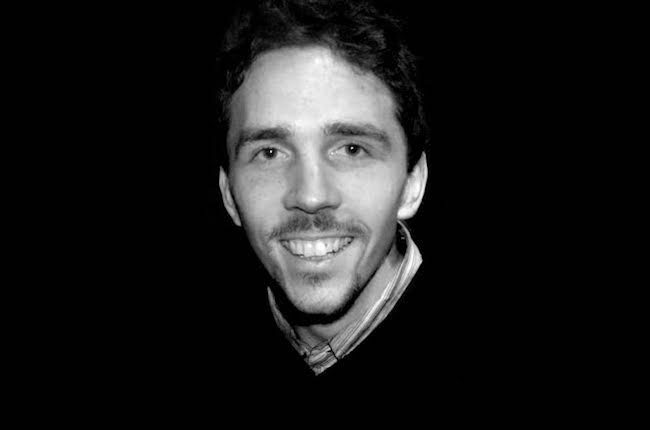 It was possibly the first one to employ a digital marketing manager and use content marketing. The Arch’s website features a magazine which is a crossover between a blog and an actual editorial mag. Topics include injury prevention, training, gear, outdoor climbing, news from sponsored athletes, yoga, parkour, and – of course – routesetting. The magazine attracts views from all over the globe, and although quantifying outcomes is practically impossible, Stone believes the long term effects of spreading brand awareness through quality content are worth the effort. He admits that his marketing activities are still run reactively, but as the business continues to grow, more precise budgeting will soon be inevitable. And speaking of growth, in 2019 The Arch will expand by opening the doors of a brand new facility. Purpose built, it will be the first of its kind in the country and Stone describes it as being simply ‘amazing’. At the coast in Devon, Fred Stone makes the time to find new, rather esoteric bouldering spots. “A lot of is really highballish, but there’s no one else out there apart from me, and it’s lovely. You’re climbing on this stuff where the conditions are never perfect, and you end up chased out by the tide, but it feels like a return to the beginning of climbing. No grades, no names, no chalk marks. No expectations, and just following nice lines,” he said.